I admit it. I recently became addicted to 'Offspring'. Yes I know I'm behind the times. But there are perks being a late TV program adopter. You have the binge watch potential, with entire series at your mercy. Que eye bleed. However, you don't get the opportunity to talk about it with fellow fans, because they have moved on. And that's where you come in, lucky, lucky you! But "How is this relevant to interiors?" I hear you wonder. Besides there being many beautifully staged interiors, there is one element that constantly struck a cord with me. It's how the friends and family interact and behave with each others homes. What intrigued me more than the delicious story lines was the fact that everyone just "popped in". Not only do they turn up at the front door unannounced, but they all just walk right on in into each others homes. No knocking, let alone a loose agreement on a time. Their homes are like small, local cafes where people all know each other and come and go as they please. The interactions range from fleeting conversations to intense scenes. It made me question if this is what actually happens in homes in inner Melbourne? With no family in Melbourne of my own, I'm not well placed to say. So I've been asking friends and random associates about theirs. Do people arrange a time to come to your house or just turn up unannounced (aka pop in)? 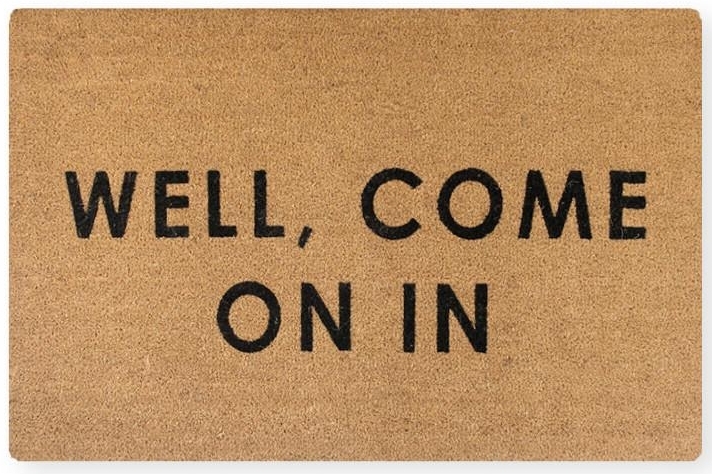 Is your front door unlocked so friends and family can just walk right on in? Do friends family have a key and when do they use it? And as beautiful the interactions in Offspring are, it would appear that they're just not representative of how life is today. Nobody really 'pops in' anymore. Your friends certainly don't turn up unannounced. Family members might if they live close, but they're not likely to walk right on in. I felt quite sad on piecing this together. I always thought my home would be like my mum and dads home. Something like Piccadilly Circus but with out all the lights. And for a family that lived in the middle of a field, that is quite an achievement. The kettle was hardly ever cold. It's still a little bit like it today, even though the kids (i.e me) have moved out. The questions it raised.... Why have we stopped this casual connection? Are we too orchestrated to 'offspring'? Is this pre-arranged approach to mingling and interacting with friends and family here to stay? Is is possible for us to revert back to popping in? The demise of the 'popping in culture' is caused by new social norms, created by busy lifestyles, physical distance from friends and family, the need for security and non traditional neighbourhoods or communities, in the main. All of these are linked. Another cause which is completely separate is our desire to have neat and tidy homes when we have visitors, fuelled by picture perfect images that we see in media. Compared to 50 years ago, people are generally more busy. Not just because we work longer hours, but because we take part in more activities and have wider social circles. Because we're busy we tend to be home a lot less. To be able to successfully pop in, clearly you need the person to be in but they also need to have the time to sit and chat. Understanding that most people are busy, we've slipped into the 'I don't want to impose' pose. This is why SMS and other forms of messaging works. Senders know that recipients will respond when they can. It puts the ball in their court. And we like that. Surely a door bell or knocker does the same thing, just in closer proximity? Our communities have changed. Families and social networks aren't all within five minutes walk from your house. They live in different suburbs, states and even countries. So popping in requires considerable more effort and time. You're not going to spend and hour in the car on the off chance that some one might be in. So we tend to arrange times to meet to get over this. It makes sense. But this pre-arranged approach has worked itself increasingly into everyday get togethers, in local networks. Arranging 'play dates' for our kids and agreeing to meet friends for coffee (more often in a cafe) is now the norm, rather than kids just cruising the streets and finding each other or you just popping in whilst you have a spare 10 minutes or are driving past. There is a saying that you can clean up far more efficiently in the ten minutes before a friend arrives than you can with an entire day up your sleeve. We're obsessed with looking like we have a clean house (C'mon it cant just be me who has a lived in look!). Trawl the internet and leaf through the magazines and you will see billions of images of picture perfect homes. Conversley trawl the internet and you'll see pages of jokes about a clean house, or unclean house, as the case may be. Oh the juxaposition. We might make light reference to 'take me as you find me' but deep down we're very insecure about what people will think if our house doesn't look like a finely tuned machine that has been beautifully and thoughtfully decorated. We have re-entered an era where we associate the need to having a clean and tidy house to the ability to accept guests into our domain. It's like a modern Downton Abbey, but without the servants to do it all for you. "How very exhausting for you, my dear" [in my finest Maggie Smith accent]. And then, this week, I got a 'popper inner'. Yes. A neighbour rocked up at my front door. No pre-arranged time. No loose "I might pop in later in the week". They were just there. Standing on the door step. The door was locked and they rang the bell. But this is the closest I have got to 'offspringing' for as long as I can remember, so I invited her in. She walked past the pile of clothes to be folded on the sofa, stepped over the shoes all over the floor, and seemingly didn't see the huge pile of washing up. We chatted. Drank tea. Laughed, screeched and remembered. For a whole two hours. It made my week. I doubt she noticed 'the mess' because I think it made her week too. If she did, it doesn't matter. So why don't you give it a try this festive holiday time. If we can't do it now, then there really is no turning back. I'll put the kettle on then shall I?.